What separates a true Silverstone premium case from any other? It's mainly the creative orientation and placement of system components to yield the best thermal performance. Instead of the common mounting methods, Silverstone engineers use something called a 90-degree method for their high end cases. This means the PCI slots (or back) of the system face out the top. The science behind it is valid since heat naturally rises. This allows them to use quieter low-rpm fans. In our review we found the Fortress 2 (FT02) to be a very quiet case. 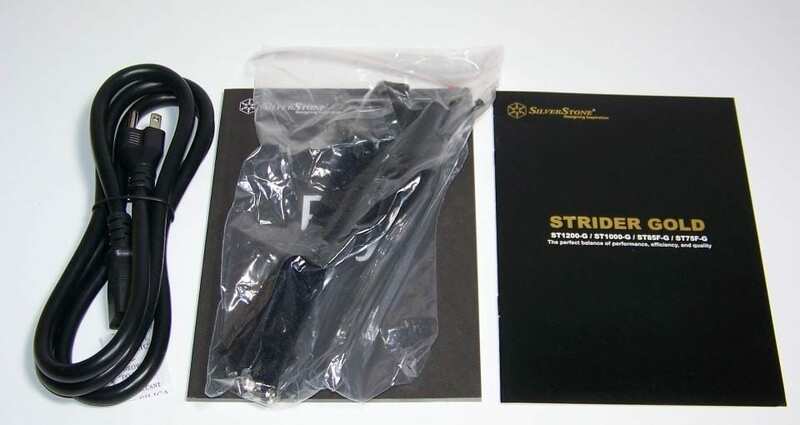 Today, we're having a look at another premium case from Silverstone called the Raven 3 (RV03) and we've got one of their Strider 850W 80Plus Gold power supplies riding shotgun. The unique internal design of Silverstone's cases is what makes them well known amongst DIY computer enthusiasts. The Raven 3 follows suit. It also offers other creative and innovative ideas. 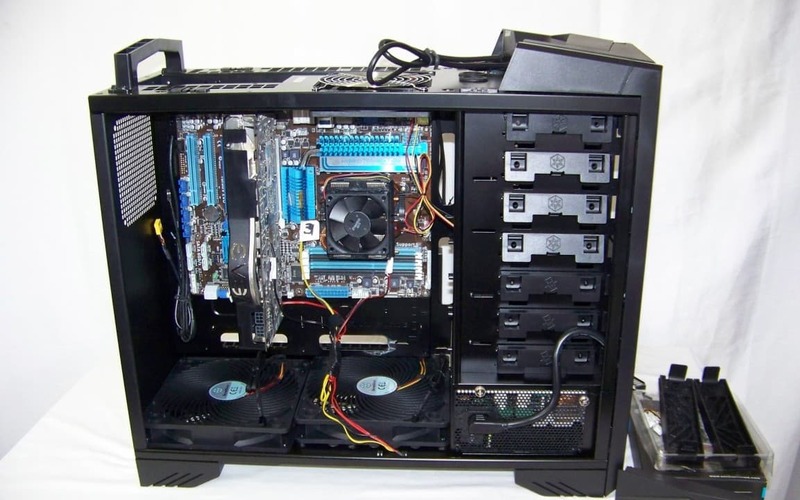 For example, this cases utilizes the back of the motherboard tray to mount some of the hard drives. 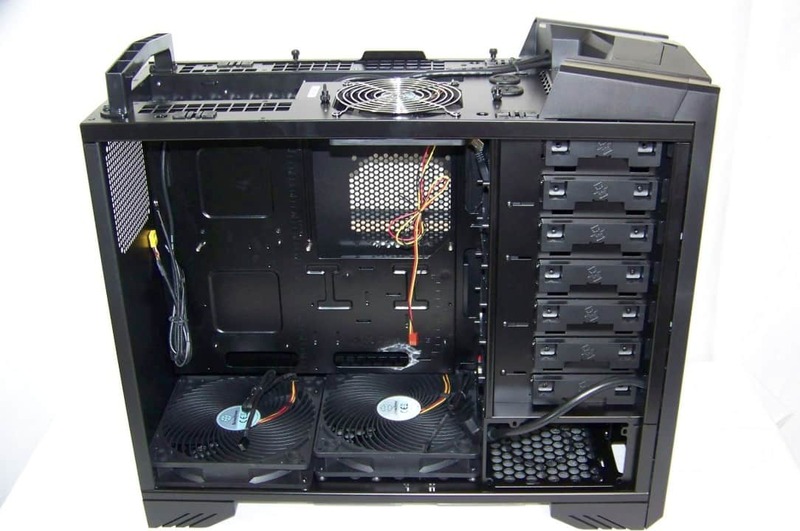 The mounting of the PSU towards the front facing side ways is also very unique. These two things alone free up more case space for other components. 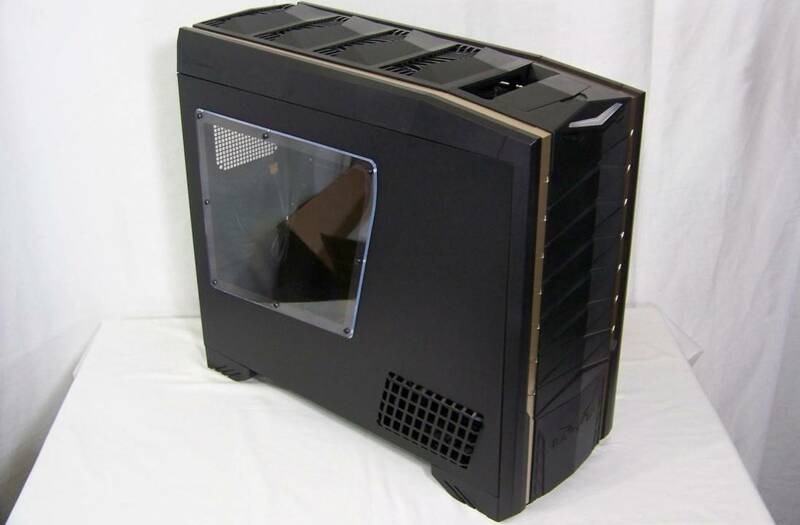 When talking to Silverstone, the idea behind the case was to offer a product that has a moderate gamer design and the idea of helping to keep gaming systems quieter. All while being able to see your pimped out components inside. Based on this design, the bulk of any escaping noise will come mainly through the top which is actually the back of the system when components are installed in this case. No feature has been omitted that I can tell. It's got wire management, storage management, dust filter management, tooless drive bays and a CPU cut out. And, the Raven 3 seems to only need two 180mm bottom fans compared to the Fortress 2 which had three. These two guide cool air upwards which forces the warm air out quicker. Plus, there are four front 120mm fans to help with additional cooling if needed. Pricing for the Silvestone Raven 3 (RV03) with gold trim starts at $149.99 and silver trim for an additional $10 at $159.99 US. Both can be found from the usual online places and is surprisingly affordable for this level of Silverstone innovation. What is an 80Plus Gold efficient PSU? Plug Load Solutions sets the 80Plus standardized specs that high quality PSUs must follow today or else it can't carry the badge. The Strider Gold 850 has been tested and able to maintain at least an 87% efficiency (power output/power consumed) whether at 20% load or 100% load. The 3.3v rail provides 22 amps, 5v rail 25 amps and single 12V rail 70 amps. Also worth mentioning is the PSU's ability to maintain a 3% or less ripple on the rails. The Strider 850 is completely modular. There are no hard wired cables attached. Users will connect the cables they need. This helps keep the system free of cable clutter because it is assumed you won't use any cables that are not necessary in your build. Silverstone focused more on the internal circuitry and not so much on a flashy chassis. 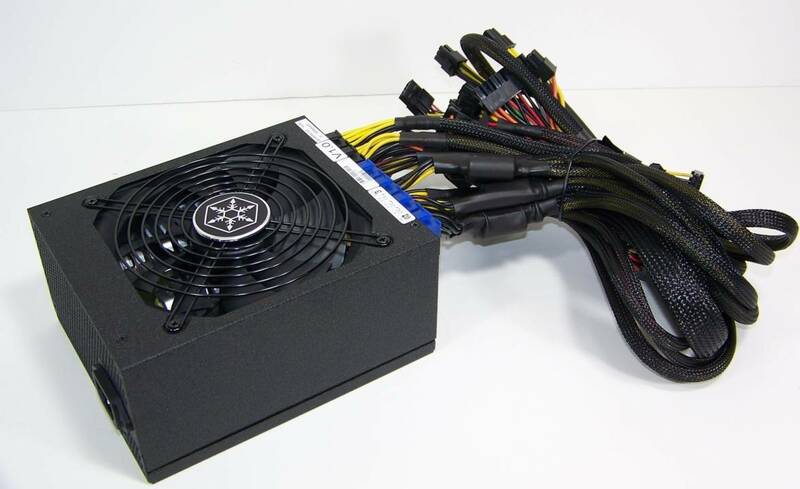 However, the PSU has a rugged finish which doesn't scar up easily. As usual, the cable sockets are color coded to keep things simple and make it easy to figure out. Some of the extras include cable/zip ties, Velcro straps, thumb screws for easy mounting, attached cabling and AC power cable. Overall, the $169.99 US price tag means your spending your money on a well designed work horse. The 1000 watt is $189.99 and 1200 watt is $289.99 respectively. Our money would be on getting the 1000 watt version for the extra $20, giving you another 150 watts to work with. We installed our hungriest, hottest and loudest test system to test the cooling benefits as well as the power supply's rails. I cheated a bit after and used a PSU load tester to confirm the Strider's efficiency and rail support. Here's the system specifics. Test System: AMD Phenom II X4 965 Black Edition processor, ASUS M4A89GTD Pro/USB3 motherboard, Corsair Dominator 4G 1600MHz DDR3 memory, 3 x 500GB Seagate Barracuda 7200.11 hard drives, NVIDIA Geforce GTX 8800 Ultra video card and Strider Gold 850 watt power supply. Temperature Measurements: NZXT Sentry LX Fan Controller. 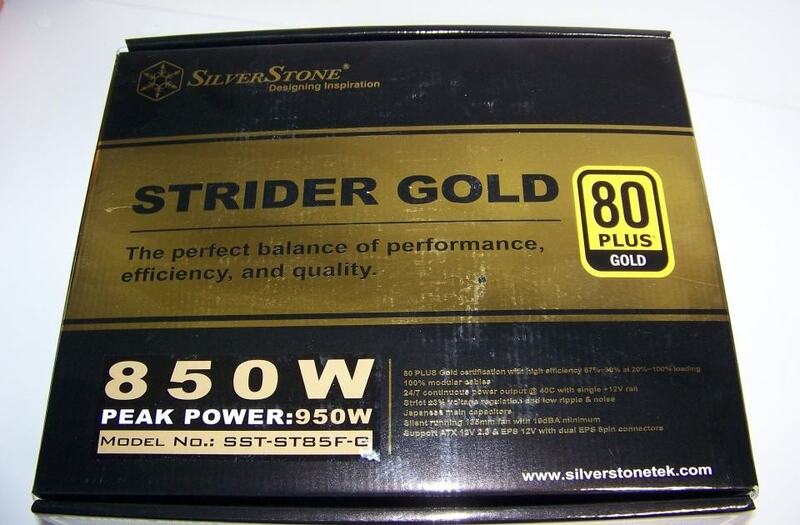 While the Strider Gold's is extremely efficient, it's up to us to confirm whether or not the power rails (3.3V, 5V and 12V) also measure up to this claim. But before we do that, let's cover any installation issues that came up during our build and how to deal with them.